There was a time when I was asked to eat burnt offerings. There were days when I was given a papad to eat and then later told that it was a poori. There were days in which the sambhar had tasted like payasam. There were even days when the dosa tasted like Italian Pizzas. Try, Try till you succeed (Vida muyarchi Viswarooba vetri) is a mantra that my wife follows. I had to write this post for two reasons . 1) These days every meal is a treat to eat. 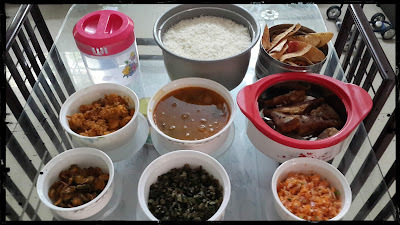 ( This is today's lunch - prawn / fish fry/ sambhar/ bitter gourd / ladies finger (okra) / salad / papad). 2) In future, I want these treats to continue to happen. 2) If the second paragraph wins the competition, then I am lucky. Okra is the 'standard' English term for 'ladies finger', Chriz. The latter is an Indianism. PS: Needn't publish this comment, just for your info. Wish you luck. Come back and tell us the results.